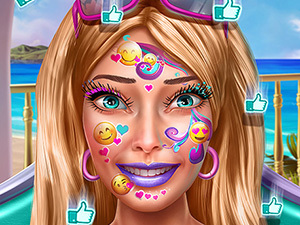 All the great make up artists from around the world have gathered here on Sisiâ€™s behalf in order to teach you their secret techniques through a great collection of online make up games. Have you ever thought why all the gorgeous celebrities look the way they do? Have you ever wished you could learn how to create cool looking make ups like smokey eyes and other fascinating designs? You can see these free make up games as a beauty guide for you and your girlfriends. In these make up games we have available at our portal you will learn how to use mascaras, pencil eyeliners, concealers, face powders, primers and all the neccessary items for a dashing make up. What best way to learn than here with Sisiâ€™s make up games? You can try your skills on celebrities like Beyonce, Katy Perry or Megan Fox! Would you just dream of having the chance of flaunting the same gorgeous make up styles that all these stunning celebrities manage to display and get admired by the crowd on the red carpet? This is your chance at beauty, use your imagination and create new styles of make up that even surpass the great make up artist of our day! Sisi has faith in you, prove her right!